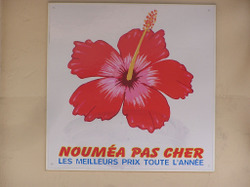 Nouméa Pas Cher - the name of a relatively cheap shop in the city centre although on a more general level it's a fairly deceptive statement - Nouméa is an expensive place to pass the time. I gather the residents don't pay income tax hence all taxation revenue is levied on a consumption type basis (which I always thought was a good idea - if we all did it). Our monetary conversion rule of thumb was to drop the last two 0s off the French Pacific Franc price and then multiply by 1.5 to get the A$ equivalent. On that basis, things roughly cost 150% (or more) of what they'd cost here in Oz. If you insist on eating at the better restaurants and staying in upmarket accommodation you're going to be in for an expensive time. We kept costs down by using public transport and doing as much self-catering as was sensible in a hotel room; picking up a fresh baguette from the local boulangerie and making sandwiches for lunch or bread and jam for breakfast. It's also strange to think that you can fly to Port Vila in Vanuatu (and fly right over the top of New Caledonia) a lot more cheaply than you can get to Nouméa. On that score we cheated - I used frequent flyer points and booked about 8 months ago, about time I got some benefit from all the sodding planes I have to catch to get to and from work.